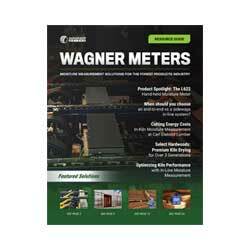 Why Buy a Wagner Meter? Rogue River, OR (December 2011) – Wagner Meters is proud to introduce the new pen-style TH-200 Thermo-Hygrometer. This compact digital device is designed to provide pocket-sized precision for flooring installers, woodworkers, and inspectors. Knowing and maintaining correct ambient conditions is critical in flooring installation and woodworking applications. The TH-200 is a convenient, pocket-size digital device for monitoring temperature, relative humidity and dew point information on any job site. Wagner Meters’ TH-200 pen-style Thermo-Hygrometer is an ideal and convenient tool for flooring installers, woodworkers, and inspectors when critical temperature, relative humidity, and dew point information must be known. The pen-style design makes for easy carrying, and the 3-button controls are very simple to use. For more information please call us 541.582.0541 or visit here. Wagner Meters is a family-owned American business that aims to provide solutions in moisture measurement technology that will enhance the quality and value of each customer’s project. With an almost 60-year legacy of innovation, Wagner continues to be a resource for both individual craftsmen and high-performance commercial endeavors.